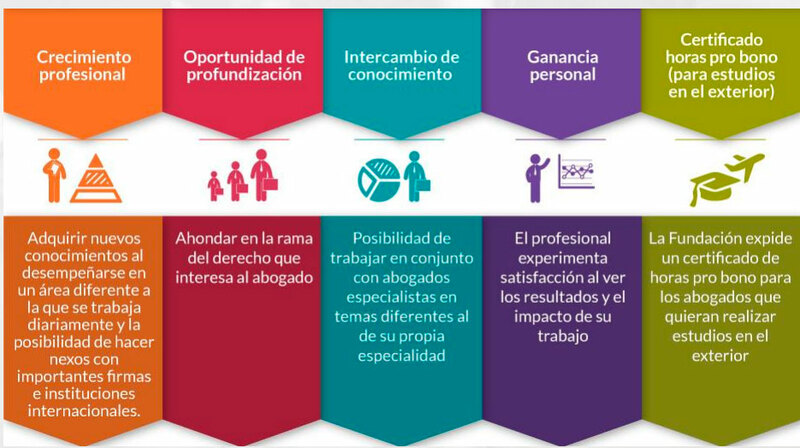 Fundación ProBono Colombia allows those people who practice law independently to actively participate in its programs and projects, adding a social responsibility aspect to their profession. Make contact so that the lawyer can become a signatory of the ““Declaración Pro Bono para el Continente Americano”, which is in custody of the CYRUS R. VANCE CENTER. Practice the social responsibility as a lawyer through their affiliation to Fundación ProBono Colombia and its work in pro bono cases. Weekly referral of the Bulletin of pro bono Cases. Possibility of counting with a pro bono intern that supports the Firm, Company, or Independent Lawyer in the handling of pro bono cases. Possibility of counting with a judicial dependent that supports the revision and follow up of pro bono cases that are found in the judicial headquarters. Participation in the different events organized in the year by Fundación ProBono Colombia. .
* The cost of the events organized by Fundación ProBono Colombia varies depending to the type of activity being carried out, some events are free for their affiliates. Annually, Fundación ProBono Colombia awards three acknowledgement awards that aim to recognize the work of a firm or legal group, a coordinator and a lawyer, which have stood out because of their personal and professional commitment to the causes we deal with daily. The people we award are a fundamental support to our team and they help us daily to promote pro bono culture. A trip to New York City for three nights and four days, in which the winner will become familiar with the most prestigious pro bono firms in the city. Go to the Vance Center and some organizations of civil society that also promote and develop pro bono work. The agenda of the trip will be constructed with the Vance Center of New York.